This first appeared in The B2B CMO column, authored by Bob Domenz for Branding Magazine. When we think about innovation, the popular image that comes to mind is the B2C company with its formal focus on innovation centers, ethnographic research, and new technology and product breakthroughs. Meanwhile, many B2B companies, especially mid-sized, don’t think of themselves as innovative, let alone have they developed an “innovation capability” with dedicated processes, staff, facilities and funding. Nonetheless, innovation is every bit as important in B2B as in B2C, and the B2B marketer has the opportunity to make a significant impact in this area of their organization. To help our readers envision their own paths to becoming B2B innovators, I reached out to several leading thinkers and practitioners, specifically to explore the role of the CMO in B2B innovation. Kim Metcalf-Kupres, CMO of Johnson Controls, where she not only guides branding and marketing but also officially “owns” the innovation function. Richard Wergan, Global Head of Brand, Communications and Digital for Philips, which not long ago returned to its brand roots as an innovator, with special emphasis on business-to-business. Robert C. Wolcott, Ph.D., Clinical Professor of Innovation and Entrepreneurship at the Kellogg School of Management, Co-Founder and Executive Director of the Kellogg Innovation Network (KIN) and a managing partner at the growth strategy consulting company Clareo, home of the CMO Forum. How is innovation different in B2B than B2C? 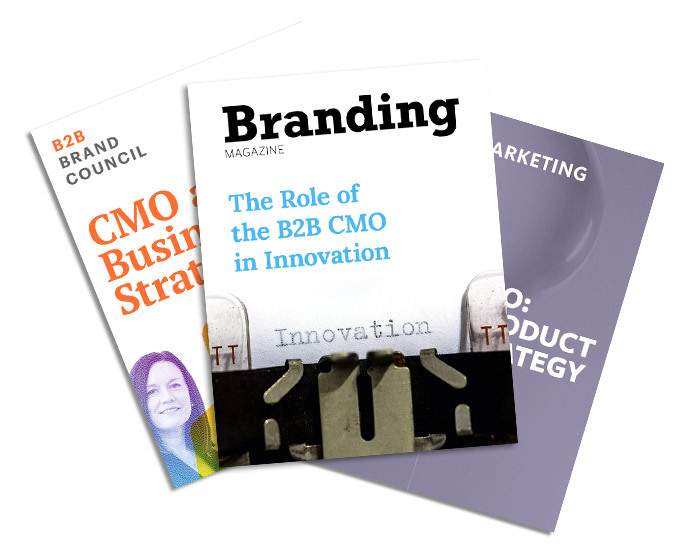 What should be a B2B CMO’s role in innovation? Innovation needs to be defined against the unique goals and context of your organization. Don’t limit that definition to just new products or technologies—innovation can include both continuous improvement efforts (finding efficiencies in the core business) as well as new growth efforts, and should encompass all aspects of your business. While there are indeed distinctions between innovation in B2C and B2B, there are fewer differences than popular perceptions suggest. Here are the highlights of the interviews. I think that this one of those age-old battles or debates. The quest to define innovation is a bit like answering the question of which came first: the chicken or the egg? At Johnson Controls, we have adopted a very inclusive definition. We want to encourage innovation and continuous improvement along the spectrum—either driving cost savings or process improvements on the operations side of the house, or growth-engine opportunities on the commercial side. If you define innovation too tightly you can choke it out. If you define it too broadly and don’t make it actionable, then all you end up with are a lot of sparkly objects and cool ideas that you can’t act on. At Phillips we have a brand promise that is based on a core idea of delivering meaningful innovation that matters to people. This means it needs to be based on individual needs and must provide benefits to an individual. It then needs to provide benefit to a community, to society, and must be delivered in a way that is also sustainable. Sometimes there’s lots of innovation that is not based on an individual’s needs, but could potentially be just innovation for innovation’s sake. I think it’s up to organizations and brands to really start putting some meaning around what innovation means to them, so that it is delivered against appropriate KPIs and has an appropriate focus. It should be a beacon of light for the business, rather than some sort of generic term. We can define innovation generically or academically, but rather than worrying about definitions, we should look at innovation based on our objectives. What are we trying to accomplish? For instance, if you’re trying to accomplish significant revenue growth, then what you’re looking for in terms of innovation is going to be different than if you’re trying to win a Nobel Prize in physics. While I like both definitions, I prefer “new combinations” because Schumpeter, being an economist, was not just talking about combining technologies to create a new product. He also meant combinations between technology and capabilities—so it doesn’t have to be formally a technology, it could be a process or something broadly defined as a technology. Those are the two definitions I like to use—but I always want to quickly get to understand the objectives and then figure out what innovation should mean in your context. At its core, innovation is very similar when you go from one setting to another. A lot of the precepts around innovation—such as business building, networks, divergent and convergent thinking, minimum viable products, experimentation…and linking efforts to incremental investments—those things could describe a B2B or a B2C company. I think the B2B problems we try to solve may be a little bit different. For instance, we’ve got more orientation on supply chain, and our product cycles are longer than what you see in a lot of consumer segments. Therefore, the ecosystems and partnerships that we build are going to be different. When it comes to delivering on innovation it doesn’t matter whether you’re in B2C or B2B. Much of the way that we approach innovation is ultimately about understanding the benefits to the end user and to the customer. However, in B2B or business-to-government, very often there is a guardian or channel for a purchase, and we need to understand the complexities of [the purchase decision-making structure] to ensure that the benefits of products and value-propositions are understood [throughout the purchasing process]. I think there’s a nuance here of focusing on the end user, whilst understanding there’s a channel, or a lens through which B2B marketers need to look if we’re going to be successful. I would say my first reaction is that the difference in how people innovate is going to be a lot greater between companies as opposed to between B2B versus B2C. That’s a good thing, but if that’s all you’re doing then really what you’re doing is being customer reactive, and that’s not enough. It’s not enough for a variety of reasons. In particular, it’s not enough because if they’re telling you that they need something, they’re probably also telling your competitors the same thing, so that’s not enough to stay ahead of the competition. The big opportunity for a lot of B2B companies is to ask, “How can we become customer leading?” How can we think beyond what the customers are already telling us? What the customers already know that they need? How can we think about what they don’t even know is possible, but which would add a lot of value for them? That’s where B2B needs to go. Marketing per se leading the innovation effort is not so much the point. It certainly can be the right function to lead the innovation effort, (and) a great driver for innovation. And it needs to be a serious part of any significant innovation efforts. On the other hand, if you have a true marketing capability at your company, the kind of marketing competency that asks, “Who are our customers? Who should they be? How do we understand them deeply and what their needs are even if they can’t tell us sometimes? What position should we be building in the market from a brand perspective?” If you have a true marketing function which asks and answers those kind of questions, then absolutely that capability needs to be at the table when you’re talking about innovation. If innovation is very much at the heart of the brand, it is easier for the CMO to get a seat at the table. But I don’t see the necessity for innovation to be at the heart of every brand proposition on the planet. Being honest about the role of innovation in your organization is important. Just as there tends to be greenwashing there’s innovation washing and innovation fatigue. I think that the role of the CMO, when it comes to ensuring that innovation is delivered in B2B, is to adapt–to own and drive innovation through the business, and be able to influence and support it where they see it. I would also say that the CMO can demonstrate how co-creation can drive the innovation agenda. By co-creation I mean teaming up with other parts of the organization, teaming with external partners, and bringing customers into the process, so that you are empowering the organization to innovate. My charter as CMO is a very broad one that includes strategy, business transformation, innovation, marketing and sales capabilities for the company and communication and brand. Even if you don’t have a seat at that many tables, as a senior marketer you can certainly have a significant role in innovation. First, you need to understand and be very clear about your company’s objectives for innovation. If the object is growth, then marketers can certainly drive growth strategies by helping create a presence in new markets, with new products and offerings. If leadership is trying to create a culture of innovation, but it’s not directly tied to building your portfolio of businesses, well, that requires a different set of skills, but one that could certainly be in a CMO’s skill set. No matter what the objective for innovation, marketing can and should play a roll simply because of its core competencies and ability to provide customer insights, market trends and market insights with which you can create linkage into the innovation engine. In short, any CMO can be a value-added contributor to innovation, whether you’re in the driver’s seat or not. The chart below is offered not as a definitive self-assessment tool but as a thought starter. It’s designed to help you begin to identify the role you can play and the possible next steps to take toward boosting your influence and value within your organization’s innovation effort. What is the role and strength of marketing within your organization today—is it one of the functions that drive the business, or a support function? How developed is innovation within your organization—is it embryonic or established? Which profile do you fit? Marketing is a leading force within your organization, but you haven’t (yet) formally defined what innovation is or undertaken an initiative to develop an innovation capability. As the owner of customer insights and data, macro trends, product launches and the like, you should be in an ideal position to become the catalyst for formally defining innovation and the goals, structure and resources needed to develop the capability. Can you become the catalyst who identifies the need for a formal innovation capability–and, in doing so, become positioned as the key driver or owner of it? You are in a sophisticated organization, possessing an established innovation function within a marketing-driven company. 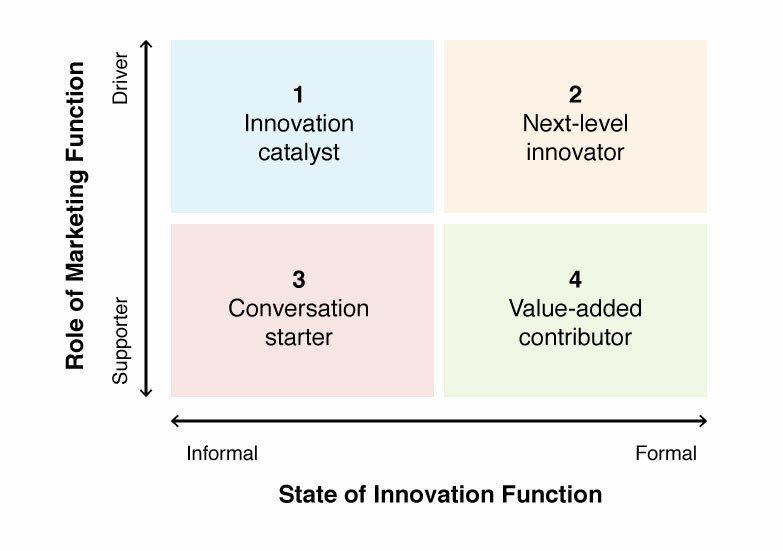 In this situation, the CMO is often a key contributor and driver of innovation efforts, and may be the owner. As an owner or key driver of innovation today, what can you do to elevate your organization’s capabilities to the next level? Innovation as a capability or initiative doesn’t yet exist within your organization, and marketing isn’t a lead driver of the business. You can help your organization become more innovative by acting as an advocate and promoter of the function. What can you do to raise awareness and interest in innovation within your organization—and to take the first steps toward creating a culture of innovation? Your organization has an established innovation capability, but marketing is not a leading function for the business. In this situation, your first objective may be getting a seat at the innovation table, or, if already there, becoming a stronger contributor—and with that raising the profile and influence of marketing. What can you do to become (and be seen as) a co-creator of innovation who adds value to your organization’s innovation efforts? Every marketing leader can positively impact innovation in their organization. However, there isn’t one answer or model that applies to all situations. You should seek to create a role that best fits the specific goals, needs, operating model and culture of your company. If you are successful, you will improve innovation, which in turn will improve business results… and thereby also enhance the position of marketing within your company.